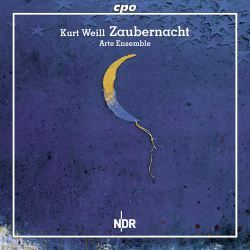 This is a self-recommending issue for all lovers of the music of Kurt Weill, a first recording of his early ‘pantomime’ Zaubernacht. But wait, the Weill aficionados will exclaim: we have already had a recording of the complete work in 2002 on Capriccio C67011, which may no longer be available but which was certainly in the catalogue at one time. Well, no. The earlier recording was not of Weill’s own score, but of a reconstruction of the score undertaken by Meirion Bowen, and thereby hangs a tale. The business of reconstructing lost scores - I do not refer here to the completion of unfinished works, which opens up a wholly different can of worms - is fraught with dangers. Where the original orchestral parts exist, an exact version of the full score can be assembled without problems apart from sheer physical and mental labour - Rachmaninov’s First Symphony is an example - but where the full score and parts are both lost, any reconstruction has to be based on materials such as vocal scores or piano reductions which may not totally reflect what the composer originally had in mind and will certainly be simplified to bring the orchestral scoring within the compass of two or four hands. This is true even when the composer himself or herself undertakes the task, as for example Alfano did with his opera Sakuntala. I speak from personal experience, having once attempted to reconstruct the mislaid full score of a thankfully short choral piece from the vocal score which I had prepared; when eventually I did run my original full score to earth in the National Library of Wales, I was more than a little disconcerted to find that it differed in considerable respects from my ‘reconstruction’ - and I had the advantage of remembering what I had originally intended. If a scholar or friend of the composer is attempting the task, the results may be quite a long way removed from what the composer had originally composed; but nevertheless it is a worthwhile exercise if it brings back into the light of day a score that would otherwise have been lost. Imagine then, the fate of someone who spends time and energy reconstructing a score, only for the composer’s original subsequently to turn up in some archive or other. That was the fate of Eric Fenby, whose orchestration of Delius’s opera Margot la Rouge was recorded by Norman del Mar (on a long-deleted BBC Artium set CD3004X) only for the original to surface a couple of years later. It has also been the fate of Meirion Bowen’s reconstruction of Weill’s Zaubernacht, the basis for the only previous complete recording of the score now inevitably overtaken by the 2006 rediscovery in the library at Yale University of Weill’s original which forms the basis for this performance. I have not heard Meirion Bowen’s version, but it was well received when the aforementioned recording was released although I am sure it differs in many points of detail even though Bowen will have had the advantage of having some parts of the original score to hand in the shape of the ‘quodlibet’ which Weill himself extracted for concert performance - as Fenby did in the case of the passages of Margot la Rouge which Delius reworked as his Idyll - Once I Passed Through a Populous City. It nevertheless is clearly true that lovers of the music of Kurt Weill will want the original version rather than any speculative reconstruction, however well the work has been done; and this new release is therefore hors concours, although the booklet does not make as much of the fact as it might have done - possibly out of consideration for Meirion Bowen’s endeavours. Bowen did apparently make some changes to Weill’s scoring, adding a clarinet (not employed here), asking the flute to double on piccolo, and had to plug some holes in the score by adding additional material from a 1918 string quartet as Weill himself originally did. What we have here does have some substantial differences from what was on offer on the Capriccio disc. The booklet notes, as is usual with CPO, are very comprehensive; and (as is unfortunately less invariably the case) they are very readable and informative, giving us plentiful detail on the music itself without going off into cloudy and speculative realms of academicism. In view of its chequered history and its relative unfamiliarity, a few words about the history of the ‘pantomime’ itself might be in order. The work was indeed originally written as a children’s entertainment, conceived by an obscure refugee from Bolshevik Russia who commissioned the young and totally unknown Weill to write a score for a chamber ensemble of nine players plus an operatic soprano whose sole role was to supply the voice of a toy fairy - she appears on only one track of this disc. The work was given a few times in Berlin, and then in New York in 1925 under the title The magic night - where the score was drastically altered to eliminate the vocal part altogether. It then totally vanished. When the materials were subsequently donated to Yale University they were mis-catalogued and forgotten. It appears that the material cut for the New York performances continues to be missing, and has had to be reconstructed from a short score which was published in 2008 and finally performed in 2010. The booklet notes that this short score differs in a number of respects from the piano version on which Meirion Bowen based his reconstruction. C’est la vie. This lack of any performing tradition may possibly be of advantage - at least we are spared the commercial editions of the music which distorted Weill’s intentions so comprehensively in many recordings of his later works. It must be said that the performers here do the work proud although it doesn’t really sound like the familiar Weill of the Threepenny Opera or the later Broadway musicals. The clean-cut instrumental lines have none of the immediately jazzy feel that informed the later music; the sounds remind one more of the music that was being produced in Paris by Les Six or even, somewhat disconcertingly, the style of Britten’s early chamber operas such as Albert Herring. Indeed the whole piece is very much in the lingua franca of the period, and the influence of Stravinsky’s Soldier’s Tale is very apparent as well as that of Satie’s orchestral scores. Would we be interested in the work if it were not by Weill? Well, yes, I think we would, because the score is always buoyant and personable, even if Weill’s later flair for melodic invention is nowhere conspicuously apparent. The early works of composers are always interesting for the sidelights they shed on the later compositional developments of the individual writer. Weill’s fingerprints are everywhere in evidence throughout. The work goes on rather too long for its material - Weill’s extraction of numbers for his ‘quodlibet’ was obviously well-advised - but the score remains interesting in its own right. It is marvellous to be able, at last, to hear it in its original form, and in such a good performance and recording.